According to In Stahlgewittern Jünger met face to face a British officer from the "Hindostan-Leicestershire" regiment the 12th December 1915 when the trenches were flooded on both sides of no man's land - they could identify the British regiment by the their particular cap badges, he writes. There was however no such regiment in the British Army, Jünger had taken the words on the badge literally: The Leicestershire Regiment had been given the honour of wearing the insignia of a tiger superimposed with the word "Hindoostan", in recognition of its long stay in India in the 17th century - quite like Jünger's 73rd Fusiliers was the "Gibraltar", entitled to wear particular cuff-titles etc. 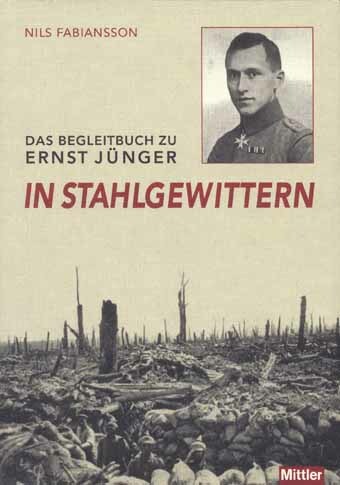 Jünger writes in the beginning of the "Douchy and Monchy" chapter, that ahead of him on his foot march from St.-Léger to Douchy back to his regiment (late September 1915) "the French autumn offensive was in full swing", that "the front manifested itself as a long, billowing cloud over open country", and that French planes came down very low. But the French autumn offensive was further north - at Monchy the opponents where British. In August 1915, that is a month before Jünger's arrival, the British Army had taken over from the French Army in the sector of the Somme, from south of Arras to the Somme river. Actually, Berles-au-Bois, in front of Monchy, remained in British hands from August 1915 until the end of the war. And the British sector expanded in order to relieve the French: By early 1916 the British held the front line from the Yser in Belgium to the Somme river in France. The offensive Jünger mentions may have been the (British) Battle of Loos or the (French) Troisième bataille d'Artois (Third Battle of Artois) at Notre Dame de Lorette (Souchéz, Vimy) - both battles were fought in the end of September 1915, although beyond Arras 25-35 kilometres north of St.-Léger and Monchy/Douchy. Judging from the grave records of the British cemetery Berles-au-Bois Churchyard Extension it seems that the British regiments facing Jünger during his year at Monchy and Douchy were the Leicestershire Regiment from September 1915 (first grave the 9th September) to March 1916; the Royal Fusiliers from March to July 1916, but also the Seaforth Highlanders in April; the Royal Irish Fusiliers from April to May 1916, and the King's Royal Rifle Corps from May to June 1916. Besides them also officers and soldiers from the Royal Garrison Artillery, the Royal Field Artillery, the Royal Engineers and the Machine Gun Corps were buried here during Jünger's stay in this sector. "Berles-au-Bois Churchyard Extension was begun by French troops, whose graves are in the South corner. It was continued by the 46th North Midland and other Divisions from September 1915, until January 1917, when it was closed. There are now over 100, 1914-1918 war casualties commemorated in this site. Of these, a small number are unidentified and one grave, destroyed by shell fire, is represented by a special memorial. Fourteen French graves and one German have been removed to other cemeteries."